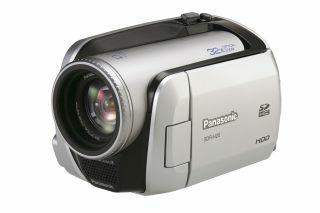 Panasonic introduced its take on a 'hybrid' camcorder at the CES electronics show, earlier this month. The SDR-H20 and SDR-H250 both have a 30GB hard disc drive (HDD) and SD/SDHC card slots. It's the budget model, the SDR-H20, that's the first to arrive in the UK. Initial impressions of the camcorder are favourable, and it builds upon the usual set of features found in budget-range camcorders. It packs a 32x optical zoom - standard for budget camcorders. Manufacturers tend to up the zoom power to add extra value to the product, but the practicalities of such a feature are few at best. Although nature fans, parents and covert intelligence agents may find it useful. The SDR-H20's two formats are what makes the camcorder stand out. The HDD is a proven new format for camcorders, but SDHC (high capacity SD) is still to take off. And the new version of the popular SD card will apparently reach sizes of up to 32GB, though we currently only have 4 or 8GB versions. Recording footage to SDHC will prove useful to anyone who has trouble working with HDD, but SDHC card slots are still a rarity. Until they're more widespread - with compatible ports built into PCs, HD TVs and other A/V devices - SDHC will remain a novelty, useful to only a handful of users. LP - 27.10 hours at 2.5Mbps. As with all the company's camcorders, the SDR-H20 is also fitted with Panasonic's optical image stabiliser (OIS). It's an adequate tool which helps smooth the natural shakes in hand movements while filming. Other features include a USB 2.0 port for transferring footage and direct to DVD burning, which requires a DVD burner on your home PC. For Panasonic's first foray into HDD, it can't be faulted. But the true test will come when the SDR-H20's footage is examined more closely. It's big brother, the SDR-H250, is fitted with a 3CCD image processor - putting it in a different league entirely. We look forward to seeing if Panasonic's legendary expertise in 3CCD pays off when combined with HDD technology.